in mediaeval times the church produced the equivalent of today's newsletters, and possibly even the antecedent of thewashingmachinepost in the form of religious calendars. these illuminated manuscripts often had the initial capital letters preceding any written discourse in script or blackletter marked in red, as often were highlighted words, known as rubrics. the first council of nicaea in 325ad decreed all saints' days, holy days and feasts which were subsequently printed on calendars also in red. in 1549, the first book of common prayer was issued marking special holy days in red ink. on these red letter days, english high court judges wear their scarlet robes at sittings of the court of law. 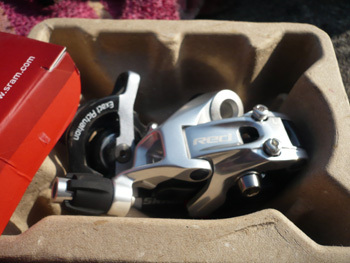 the arrival of a brand new sram red groupset might also conceivably be considered a red letter day. the chris king cielo currently residing cosily in thewashingmachinepost bike shed arrived wearing a sram rival groupset; everything apart from the calipers, because the cielo has more than adequate clearance for a beautiful set of full wood fenders, necessitating a deeper drop than currently provided for by either sram or campagnolo. shimano are the only ones providing a quality set of 58mm drop brakes, so the cielo has a pair of those. 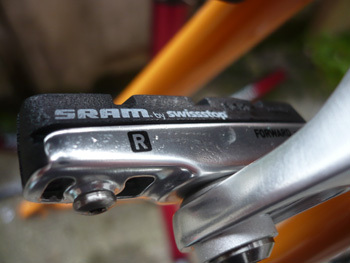 this was not my first experience of a sram groupset and its idiosyncratic double-tap shift levers, but it was certainly my first lengthy opportunity to do so, and i can honestly say that it has been a real pleasure. the gearing seems far more tolerant of what would likely cause a mis-shift on any of the other two, and deals very well with slightly maladjusted cables, though aesthetically it is nothing to write home about. all the components are, however, particularly well made, from the alloy compact chainset down to the front derailleur, and aside from pilot incompetence in the double-tap department, it has worked beautifully for the last eight months. however, a sram rival groupset costs, according to a quick poll of the online retailers i could find, around £500, less than half the cost of sram's current top of the range red groupset, and given how well it has behaved through thick and thin, i began to wonder, as i do when out on the cielo for a while, just how much better could a red groupset be? and was the extra 500 or so pounds sterling really justified by a few carefully applied coloured stripes. i am extremely grateful to uk sram distributors, fisheroutdoor who kindly acquiesced to my request for a red groupset to fit on the cielo so that i could satisfy my, and your, curiosity. it is perhaps stating the obvious that the kit sent from fisheroutdoor was minus the bottom bracket; for this is a chris king cielo we are dicussing here, and while i have no wish to disparage that particular component from sram, i doubt it could improve on the resident bearings from portland. currently decorating cielo frame and forks are a pair of red double-tap shifters, complete with gore ride-on cables, a red rear derailleur, front derailleur, carbon chainset, hollow pin chain and a 1090 cassette. prior to hitting the nitty-gritty, i feel it only right and proper that i point out the effectiveness of sram's cardboard packaging. though the exterior trendy and colourfully red boxes suitably advertise their contents, there endeth the bling. the interior trays contoured to contain their respective components are constructed from porage coloured and textured, recycled paper material, similar to that used for egg-boxes. i would unreservedly like to award sram a whole chunk of brownie points for this; other than the odd plastic bag to keep safe those little bits that need to be kept safe, there is nary a smidgeon of plastic employed in what always becomes throwaway packaging. impressive attention to detail. having stripped out the rival components ready for their higher quality replacements, i discovered the opening limits of my incompetence and misapprehension. 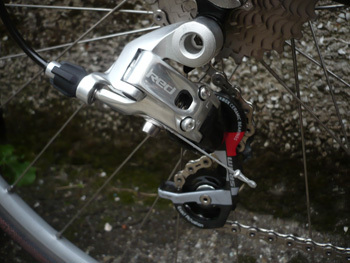 the red front derailleur was the braze-on version, but the cielo frame bears not the necessary flange, the rival version being clamped in place. however, all was not lost; several manufacturers provide clamp-on braze-ons (if that doesn't sound too complex a concept), so i ordered one to aid the fitting procedure. 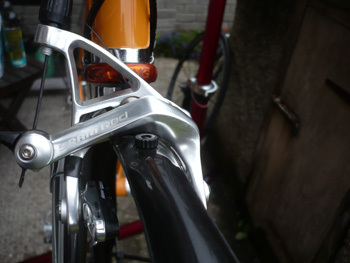 of course, had i been a trifle more technically savvy, and likely a bit more observant, i would have seen that the rival front mech was secured to the clamp on the drive-side via an allen bolt. simply removing the rival mech from the clamp left the ideal space for the red front mech. 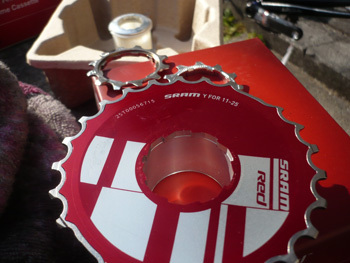 however, my own oops was matched by one from sram themselves, an ommission not related to fisheroutdoor. 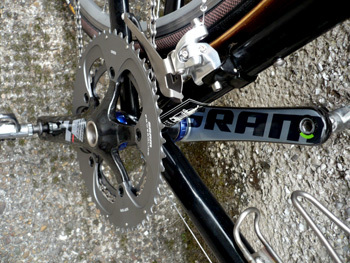 sram chains join together with a use once power-link which, according to the labelling, is supplied along with the chain. only, in this case, it wasn't. being one of those resourceful chaps, i actually had the very item sitting in the shed, so it was a snap (pardon the pun) to fit the chain despite the missing link. though the rival chainset had the smaller rings of the compact chainset variety, the red chainset shifted me back to the days when men were men and chainrings were 53/39. 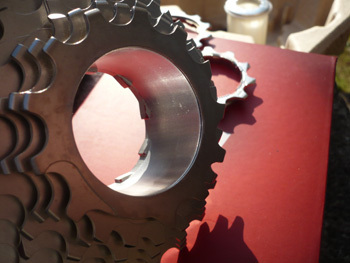 this runs the hollow pin chain over a cassette carved from a single forged chunk and then cnc'd into the shape of a set of sprockets; only the smaller two were separate sets of teeth. whatever you think of the process or the idea, this has to be a more rigid structure; there is no way there can be any flex or independent movement from the sprockets, though this is undoubtedly the logical conclusion of the total lack of replaceability of any individual set of teeth. but then, who would ever think of doing that anyway? the chris king bottom bracket, previously discussed, remained in its reserved place. it's a beautiful piece of engineering in every sense of the word and concept, but in its natural form, it is not compatible with a sram crankset. the left crank fits onto the bottom bracket axle by sliding onto a set of splines machined into the non-drive side. it is then held in place by a substantial allen bolt sitting inside a built-in self extractor. it's a fairly common practice nowadays. however, those splines are longer than the chris king bottom bracket cups can cater for, meaning that the point at which the bolt has been fully tightened, there is still substantial play in the crank arms. chris king supply their bottom brackets intended for use with sram chainsets complete with a machined spacer that slides over the splined section of the axle, reducing the length of the splined region, and allowing correct pressure to be exerted by the allen bolt,creating a rigid and perfectly adjusted crankset. i will confess that, after the continued excellent service from its lesser sibling, i pretty much had this article pre-written in my head. 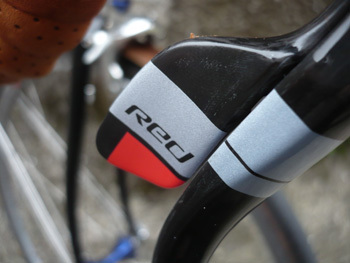 sure, the red groupset has much to recommend it externally; i particularly love the enormous sram lettering on the inside of each carbon crankarm, but i'm kidding no-one that this has any bearing on its operation. in fact, couldn't see how the spending of an extra half-grand could possibly be justified, and i'm sure there are many of you nodding your heads in agreement. but we are wrong. maybe not incontrovertibly wrong, but wrong nonetheless. how the bits work and how well they do so is almost upon us, but aside from a very pleasing and modern aesthetic, transforming the cielo in more ways than one, there is an obvious benefit before a pedal has been turned. after the groupset had been fitted, it was lunchtime at washingmachinepost cottage; with rain on the horizon, the bicycle was returned to the bikeshed but with considerably less heft than had been required to take it out. the cielo is a steel frame and fork with normal wheels and tyres, so it will not trouble the uci commissaires, but the fitting of a full complement of sram red took it several steps closer. this is also apparent in the ride quality. i'm a bit unsure where to start, but i don't think anyone would argue too much if we deal with the bits under each hand; those double-taps. i have done my very best to make allowances for the fact that the cables are brand new, something that always has a positive effect on any gear system, for at least a short period at any rate. a set of gore ride-on cables will likely accentuate this difference, but in practice not only are the shift levers encouragingly crisp and happy, they're far less prone to flex when double-tapped. shifting up or down is precision personified, and i've managed finally to figure out just how much of a push is necessary to slide the chain up the block (possibly the first time that description has been so apt). as someone with a long history of campagnolo spoken here, the on or off changing at the front has meant an adjusting of perception; there is no trimming of the front mech at all, either up or down, but comfortingly, once the cable adjustment is sorted, there really is no need anyway. setting up inner and outer stops is simplicity itself for those intent on avoiding an andy schleck moment. as campagnolo shift (pardon the pun) their super record rear gear to 100% carbon fibre, and shimano retain the alloy construction of the dura-ace mech, sram occupy the middle ground with an aluminium alloy main body joined to a carbon inner link and jockey cage. however, the factor that adds a sparkle to the rudy projects is the employment of ceramic bearings round which the jockey wheels must revolve. you can huff and puff over the cost factor, but this is likely the first feature you'll notice within the first few pedal strokes, and it is a not insubstantial feature to notice. combine the double-tap levers with a solid-state cassette and a highly effective rear mech, and that chain slides up and down from eleven to 25 like a hot knife through butter. i mentioned those brakes, did i not? a pair of beautifully machined and commendably shiny silver calipers arrived in the box, a pair of brakes that deserved to be reviewed in company with their compatriots. there is no way those can be fitted to the substantial frame clearance on the cielo, but they do fit the colnago master just dinky-doo, so that is where they currently reside. unlike vicenza's offerings at the upper level, both front and rear utilise the dual-pivot principle, and very noticeably a set of pads manufactured by stopping favourites, swiss-stop. i am no engineer or informed mechanical expert, so i cannot argue with the construct in terms of their stopping power, but i do not favour their aesthetic. it's a trivial point, particularly regarding components that are all but hidden from the eye when pedalling, but i will concede that their shininess makes up for this at least in part. what is certainly not in question is their ability to stop a bicycle in a hurry. there is a bit more squeeze required than i had expected, though this should be tempered with the knowledge that the colnago previously wore a pair of zero-g calipers that operate via a cam action and thus require less effort on behalf of the rider. 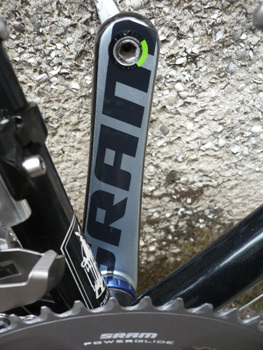 campagnolo may well have the system well-sussed, having dispensed with a dual-pivot at the rear some years ago on the basis that that amount of power is not required on the rear brake. having never locked up the rear wheel on a campag equipped bicycle, i had done so twice in the space of a few hundered metres with those from red. this is not a complaint; once awareness dawns, it is a simple matter of modulating the rear caliper under braking. it did not happen a third time. 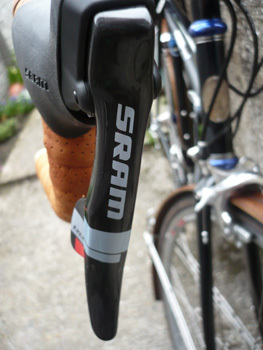 this is sram's top of the range groupset, so it is perhaps no real surprise that it all works as well as it does. they may be sponsored riders, but andy and bertie still have to pedal those s-works, and though you don't get first and second on the tour podium becasue of the colour of your groupset, it does have to perform flawlessly to allow a bit of concentration on those other factors that tour winners concentrate on. but is it worth it compared to the rival groupset two doors down the hall? i am a cynic. i am not pre-disposed to believe the marketing ploys of anyone. i dearly love colnagos in spite of their marketing, rather than because of it, and i know that anthony charteau would have been king of the mountains had he ridden any other brand of bicycle. so a cool logo and an impressive palmares are not really enough to persuade me to double that paypal expenditure for those features alone. but rather annoyingly, especially since i had already pre-judged the situation, and mentally decided the answer was no. i was wrong, proving that pre-judgement favours no-one. it will take several more months of riding a red groupset, and bear in mind this is the same bicycle in both instances, to make an underlined judgement, but on the basis of a few weeks and some crap weather, i would have to say that in this case, double the money is pretty much the equivalent of double the value. i will come back at a later date to say whether the song remains the same, even if i got it wrong again. but i don't think so. i must qualify this by saying that such an observation depends entirely on what you expect to get from your bicycle and what sort of riding you do. if you race, the question is almost pointless; red everytime. if you demand the very best for your cycling pleasure, my answer would be the same. however, if your cycling could more aptly be fitted into the category of aimless sauntering, i don't think red is necessarily for you. you'd notice the difference sure enough, but it is unlikely that you'd ever find its true limits and sram rival would carry out everything needed. the law of diminishing returns has not been voided, but it's starting to look a little ragged round the seams.